A couple of weeks ago just before the World Cup started I put my name in for the World Cup Beer Sweepstake. I figured that as well as being fun it would be a good start to my more determined blogging efforts. So here is the blog post that is required by the competition for a legitimate entry into the sweepstake. I was pretty lucky to draw Spain. Lucky on a number of fronts. Firstly from a football point of view. Spain are favourites to win the world cup and so I am favourite to win the beer haul, nice. Secondly from a personal point of view: I love Spain, I love its food, its weather, its wine and the people. 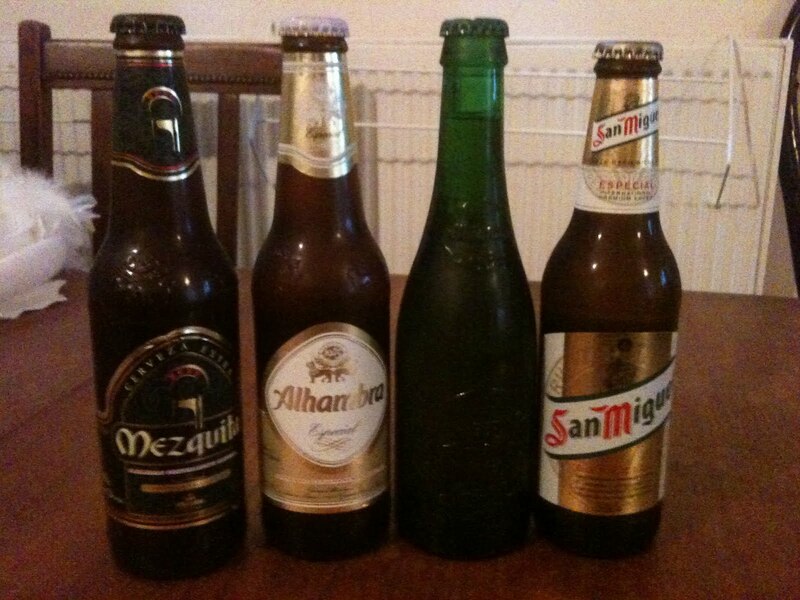 Thirdly the most popular Spanish beer in the UK is very easy to get hold of. So this third point is not very inspiring for a world cup beer extravaganza but I knew that if I failed to find any interesting beers that I could fall back on San Miguel. So I did a little research into Spanish micro-brewerys and to be honest realised I would be hitting a brick wall pretty fast unless I flew to Spain. So instead I got the train to Brighton and visited Trafalgar wines, a little beer and wine shop near the station. Here I found my first Spanish beer of the tournament, Alhambra Mezquita. It is from a large brewery but at 7.2% this is no standard Eurolager. But I wanted more, so on the morning of the Spanish feast I was planning I caught another train to London bridge and visited Utobeer where I found a couple more Elhambra beers, the (not very special) Especial and the very smart looking looking Reserva 1925. I also picked up a San Miguel for good measure. Here is a picture of my handsome amigos. Lovely looking bunch aren't they. 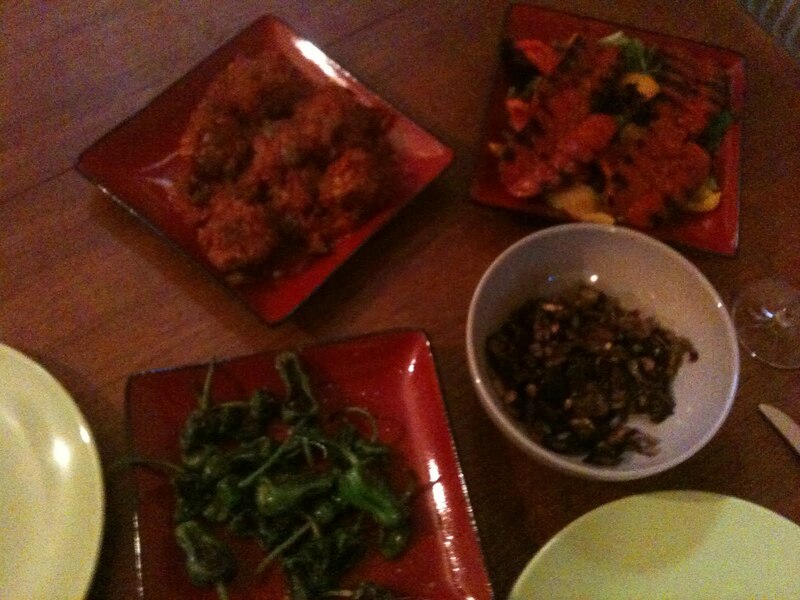 Later that evening, I had my four beers to try and I had cooked up some spanish treats. Apologies for the poorly lit, grainy and frankly terrible Iphone picture of the spread but below you should be able to make out, clockwise from bottom, pimentos de padron, albondigas, chorizo with grilled peppers and salad and aubergine with pinenuts. We opened the bottle of San Miguel first. Prevalent as this lager is in the bars and chain pubs of London this held no surprises. It tastes like what it is, a passable standard premium lager that this tastes a lot better when sitting in a park in Barcelona. So moving quickly on we then opened the Alhambra Reserve 1925. The aroma has hints of light malts and caramel. This weighs in at 6.4% ABV but seemed to wear this strength well and actually came across quite lightweight. The flavour is typical lager with some nice caramel notes. But to be honest I was quite unimpressed and we ended up finishing it up quickly so we could move on to the next beer. The Alhambra Mezquita was a huge improvement. It pours a lovely amber colour with a small white head. (I apologise for not taking any photos of the poured beers, I'll have to remember to stick to the blogging rules in future: Number 1. take as many photos as possible). The aroma was heavy with caramel, dried fruits and sherry. The sherry may have come from the high alcohol content but was far from unpleasant. The flavour was much like the aroma, heavy on the caramel and dried fruits. By the end of the small glass the sweetness became cloying and left an aftertaste that was not very pleasant. After this beer we decided to skip the Alhambra Especial and opened a bottle of wine. It was an Angosto white from Oddbins, as this is a beer post I won't give any tasting notes but I will say it went very well with the remaining tapas and is an excellent and interesting wine. After the main course we had a slice of almond tart from Brindisa called Torta de Santiago. 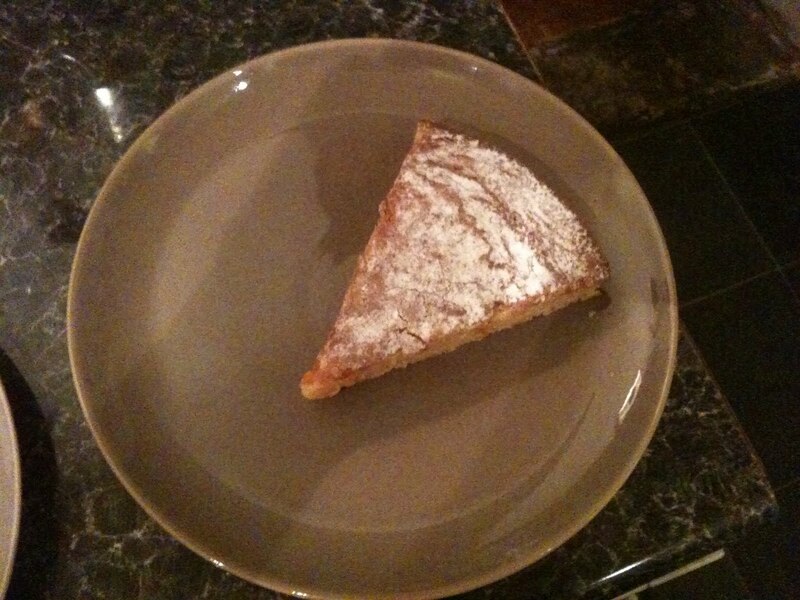 It was light, crumbly and decadently rich. I'm going to find a recipe for this and make it because it is awesome. This is what it looked like I did eventually drink the Alhambra Especial and to be very honest it had no positive aspects at all, it was shite. A bit like England's performance in this world cup. Ah well, at least we are beating the Aussies in the cricket. Very brief thoughts on food blogging and this blog. I have been meaning to start this food blog for proper for a while now, but I think I've been facing the same dilemma that a lot of people have when starting out on this path. The problem is there are a LOT of food blogs and a lot of them are pretty good. Why would anyone want to read mine and what the hell would I write about anyway? I've been tempted to do a cookbook cook-through blog, but this is a lot of commitment and there are other people who do an excellent job which I probably wouldn't live up to. I also have an excessive number of cookbooks and picking one would be tricky. I would also like to do a beer and wine blog but again I think I would be put to shame by my lack of subject knowledge compared to some other established blogs. But recently two events have created the kickstart to get going on my quest to have a well maintained blog. Firstly and most importantly I'm getting married to my wonderful fiancee (hi Claire) and I am sure this will be the most wonderful day of my life. But it will also mean I am going on what I hope will be the most wonderful holiday of my life. 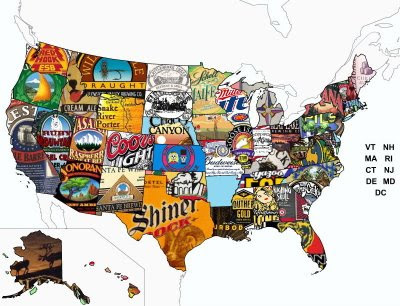 We are going for a three week tour of the USA stopping in at New York, Chicago, Las Vegas and San Francisco and sampling all the best food that these cities have to offer. I will be recording these meals and other food experiences here for my famliy and friends to read about and maybe some other people may start reading and like what they see. There will be many treats on our journey including some of the best restaurants in the world, some of the best fast food these cities have to offer, some world renowned breweries and a baseball game! The second event that will push me into the blogosphere is the World Cup, more specifically the World Cup Beer Sweep organised by Mark of Pencil and Spoon and Andy of Beer Reviews. The premise of this competition is to find a beer from your assigned World cup playing country and blog about it. If your team wins you win an excellent beer prize. I very luckily drew Spain, so having found a beer in Brighton last weekend I will be cooking up a Spanish extraganza this weekend and blogging about it. I just hope the beer is nice! Follow everyone's efforts on twitter at #wcbeersweep. I think I'll wrap it up now, all this typing has left me exhausted.